Bike & Trails Committee Mtg. Name: Bike & Trails Committee Mtg. The Bicycling & Trails Committee of the DeLand Area Chamber of Commerce is the only bicycle advisory committee supported solely by the business community in the United States. This committee was created to promote bicycling & trail activity in DeLand and the greater West Volusia County area through advocacy and education for the betterment of both citizens and the businesses of our community. 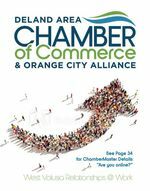 The DeLand Area Chamber of Commerce understands that walkable and bikeable communities are good for business!